15 April 2015. Confirmo Ltd, is proud to announce the public launch of the CoinMate.io Bitcoin Exchange. It offers users in Europe and around the world banking grade security, two-factor authentication, 2 confirmation bitcoin deposits, speedy bitcoin withdrawals and a 0.2% fee on all trades. It accepts Euro, Koruna, Zloty and OKPay. CoinMate.io allows people to quickly buy or sell bitcoins with instant orders, or set market prices to speculate on price changes. Advanced traders can access the exchange via API, and build bots to trade on the exchange. The verification process is completed in one working day, requiring photo ID and proof of address for individuals, and further registration information for those operating a company account. However, the exchange does not provide services to US citizens. European users in the 34 SEPA countries can deposit Euro in 1-2 working days. This is converted into dollars at the time of receipt using the xe.com exchange rate plus a 0.5% spread. Withdrawals are processed twice a day, and in some cases, payments sent in the morning can hit client’s accounts on the same working day, or next day. Developed over two years, CoinMate.io incorporates security best practices from the finance industry. The exchange uses banking grade SSL encryption combined with two factor authentication on important actions via email or Google Authenticator. Over 95% of funds are held in cold storage in multi-sig wallets. CoinMate.io is available now at http://www.CoinMate.io and has a $1 bonus for new accounts that complete verification until the end of May 2015. You can also follow it at https://twitter.com/CoinmateBT . 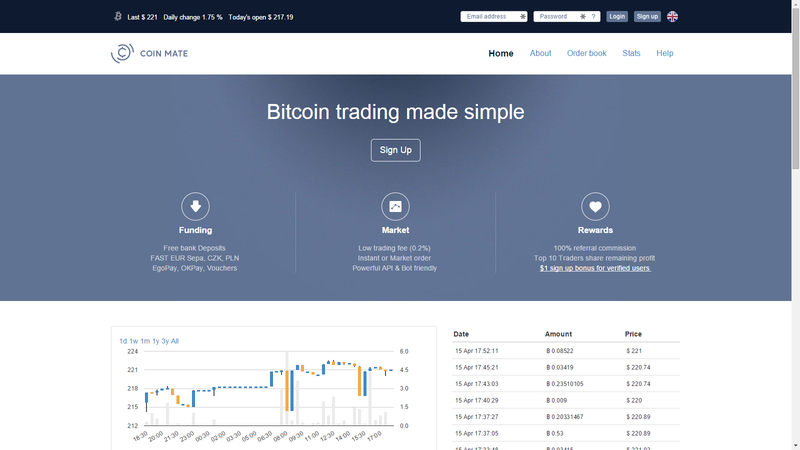 CoinMate.io is a European Bitcoin Exchange, denominated in USD. It enables buyers in the SEPA area and beyond, to quickly and easily buy, sell and trade bitcoin with a low 0.2% transaction fee and one working day identify verification. Advanced traders can use the exchange via API. It supports deposits and withdrawals in Euro, Czech Koruna, Polish Zloty and OKPay. The exchange holds 95% of client funds in multi-sig cold storage, and employs banking grade SSL, and email or Google Authenticator 2FA to give our clients peace of mind.